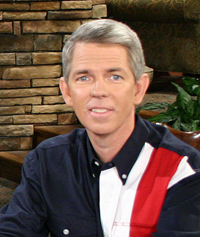 WallBuilders' founder and president, David Barton, resides in Aledo, Texas (just west of Fort Worth), with his wife, Cheryl, and their three children. David spent eight years as an educator and school administrator before founding WallBuilders. He has received numerous awards including several Who's Who honors, two Angel Awards for excellence in media, and the George Washington Honor Medal. He has spoken to numerous state legislatures, consulted with both state and federal legislators on various bills, and has written amicus briefs in cases at the U. S. Supreme Court. 5 Steps to Transform into a Proud Patriot! 1. Read about our country's history. Most Americans know very little about our country's fascinating history. Check a good American history book from the library or read about our country online. Wall Builders is an excellent web site about our history and Christian heritage. 2. Watch national news.Having had friends at Fox News and CBN, we favor watching clips online at their sites: Fox News and CBN News. 3. Always vote. Erase apathy from your vocabulary. Exercise your right to vote. Voting does make a difference! 4. 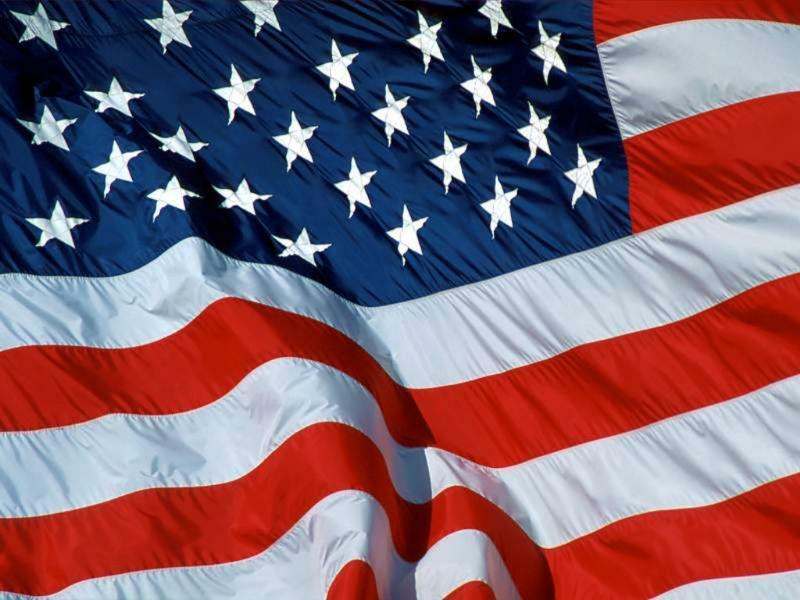 Learn the words to the "Star Spangled Banner." Watch a video of Stacie singing the National Anthem here. 5. Pray for our country and its leaders! When hearts change, new policies follow. Happy 4th of July! Celebrate and commemorate our God-given freedom today. After enjoying family, festivities, and fireworks, we hope that you will pause for a moment to pray for our country and praise God for our liberty. Read the Declaration of Independence today. Think about the importance and meaning of the document...and what it still means today. We are honored and excited to feature a special feature article by David Barton. Read and discover fascinating historical facts about the birth of our nation. Today is a perfect time to remember that freedom is not free. It must be cherished and protected. President Ronald Reagon correctly stated, "Freedom is never more than one generation away from extinction. We didn't pass it to our children in the bloodstream. It must be fought for, protected, and handed on for them to do the same, or one day we will spend our sunset years telling our children and our children's children what it was once like in the United States where men were free." Take courage and fight for freedom! And remember Ps. 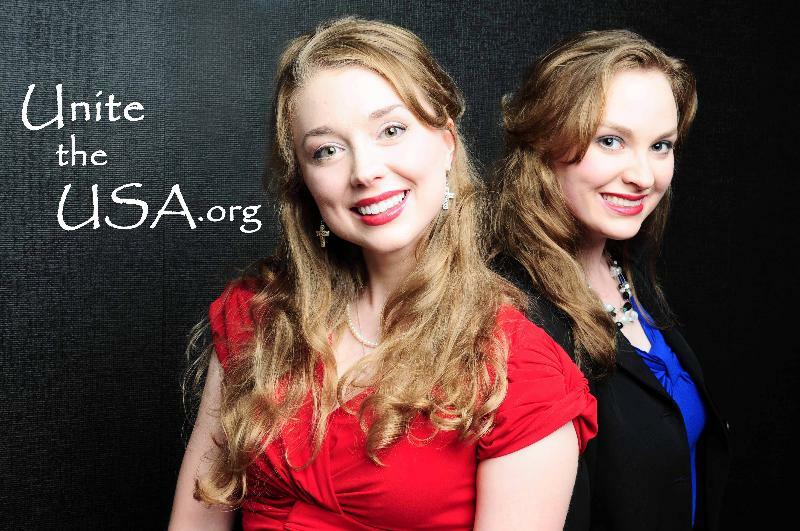 33:12 (ESV): "Blessed is the nation whose God is the LORD..."
Founders of Unite the USA! This year marks 230 years since our Founding Fathers gave us our National Birth Certificate. We continue to be the longest on-going Constitutional Republic in the history of the world. Blessings such as these are not by chance or accidental. They are blessings of God. On July 2, 1776, Congress voted to approve a complete separation from Great Britain. Two days afterwards - July 4th - the early draft of the Declaration of Independence was signed, albeit by only two individuals at that time: John Hancock, President of Congress, and Charles Thompson, Secretary of Congress. Four days later, on July 8, members of Congress took that document and read it aloud from the steps of Independence Hall, proclaiming it to the city of Philadelphia, after which the Liberty Bell was rung. The inscription around the top of that bell, Leviticus 25:10, was most appropriate for the occasion: "Proclaim liberty throughout the land and to all the inhabitants thereof." To see the turmoil in other nations, their struggles and multiple revolutions, and yet to see the stability and blessings that we have here in America, we may ask how has this been achieved? What was the basis of American Independence? John Adams said "The general principles on which the Fathers achieved independence were the general principles of Christianity." Perhaps the clearest identification of the spirit of the American Revolution was given by John Adams in a letter to Abigail the day after Congress approved the Declaration. He wrote her two letters on that day; the first was short and concise, jubilant that the Declaration had been approved. The second was much longer and more pensive, giving serious consideration to what had been done that day. Adams cautiously noted: "This day will be the most memorable epic in the history of America. I am apt to believe that it will be celebrated by succeeding generations as the great anniversary festival." It is amazing that on the very day they approved the Declaration, Adams was already foreseeing that their actions would be celebrated by future generations. Adams contemplated whether it would be proper to hold such celebrations, but then concluded that the day should be commemorated - but in a particular manner and with a specific spirit. As he told Abigail: "It ought tobe commemorated as the day of deliverance by solemn acts of devotion to God Almighty." John Adams believed that the Fourth of July should become a religious holiday - a day when we remembered God's hand in deliverance and a day of religious activities when we committed ourselves to Him in "solemn acts of devotion to God Almighty." Such was the spirit of the American Revolution as seen through the eyes of those who led it, evidenced even further in the words of John Quincy Adams, one who was deeply involved in the activities of the Revolution. In 1837, when he was 69 years old, he delivered a Fourth of July speech at Newburyport, Massachusetts. He began that address with a question: "Why is it, friends and fellow citizens, that you are here assembled? Why is it that entering on the 62nd year of our national existence you have honored [me] with an invitation to address you. . . ?" The answer was easy: they had asked him to address them because he was old enough to remember what went on; they wanted an eye-witness to tell them of it! He next asked them: "Why is it that, next to the birthday of the Savior of the world, your most joyous and most venerated festival returns on this day [the Fourth of July]?" An interesting question: why is it that in America the Fourth of July and Christmas were our two top holidays? Note his answer: "Is it not that, in the chain of human events, the birthday of the nation is indissolubly linked with the birthday of the Savior? That it forms a leading event in the progress of the Gospel dispensation? Is it not that the Declaration of Independence first organized the social compact on the foundation of the Redeemer's mission upon earth? That it laid the cornerstone of human government upon the first precepts of Christianity?" Have you ever considered what it meant for those 56 men - an eclectic group of ministers, business men, teachers, university professors, sailors, captains, farmers - to sign the Declaration of Independence? 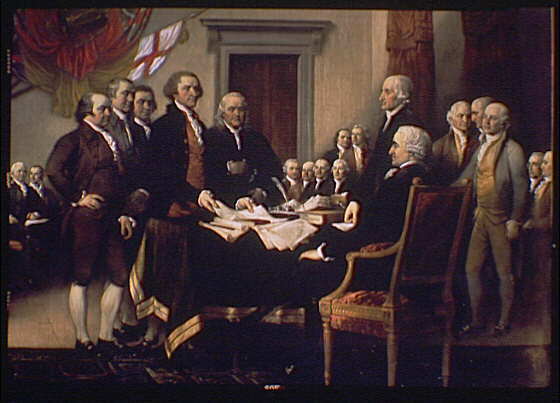 This was a contract that began with the reasons for the separation from Great Britain and closed in the final paragraph stating "And for the support of this Declaration, with a firm reliance on the protection of Divine Providence, we mutually pledge to each other our lives, our fortunes, and our sacred honor." Dr. Benjamin Rush, the father of American Medicine and a signer, recorded that day in his diary. In 1781, he wrote to John Adams "Do you recollect the pensive and awful silence which pervaded the House when we were called up, one after another, to the table of the President of Congress to subscribe to what was believed by many at that time to be our death warrants? The silence and gloom of the morning was interrupted, I well recollect, only for a moment by Colonel Harrison of Virginia (a big guy) who said to Mr. Gerry (small in stature) at the table: 'I shall have a great advantage over you, Mr. Gerry, when we are all hung for what we are now doing... From the size and weight of my body I shall die in a few minutes, but from the lightness of your body you will dance in the air an hour or two before you are dead.' This speech procured a transient smile, but it was soon succeeded by the solemnity with which the whole business was conducted." These men took this pledge seriously. Robert Morris of Pennsylvania is an example of the highest level of integrity. He was chosen as the financier of the American Revolution. What an honor, except that there was no bank willing to give any loans to help fund the revolution. It was three years and the Battle of Saratoga before America got any kind of funding at all. After winning that battle, foreign nations like France, Holland, and others decided maybe we weren't such a bad risk and began loaning us money. So where did we get money for the first three years? Congress, at that time, could not have obtained a loan of one thousand dollars, yet Robert Morris effected loans upon his own credit, of tens of thousands. In 1781, George Washington conceived the expedition against Cornwallis, at Yorktown. He asked Judge Peters of Pennsylvania, "What can you do for me?" "With money, everything, without it, nothing," he replied, at the same time turning with anxious look toward Mr. Morris. "Let me know the sum you desire," said Mr. Morris; and before noon Washington's plan and estimates were complete. Robert Morris promised him the amount, and he raised it upon his own responsibility. It has been justly remarked, that: "If it were not demonstrable by official records, posterity would hardly be made to believe that the campaign of 1781, which resulted in the capture of Cornwallis, and virtually closed the Revolutionary War, was sustained wholly on the credit of an individual merchant. "America couldn't repay him because there was no money and yet Robert Morris never complained because he had given his word. You see the same thing in the life of John Hart. He was a strong Christian gentleman and Speaker of the House of Representatives in New Jersey. He promised to help provide them with guidance and leadership. There were three things that were important in his life; his Savior, his family and his farm. Because of his signature on the Declaration, the British were seeking him (and the rest of the signers) to execute as traitors.John Hart fled his home after which his farm was ravaged, his timber destroyed, his cattle and stock butchered for the use of the British army. He did not dare to remain two nights in the same location. After Washington's success at the battle of Trenton, he finally returned home to find that his wife had died and his children scattered. He lost almost everything that was important to him but kept his word. John Hancock, a very wealthy individual lived in a mansion reflecting his princely fortune - one of the largest in the Province of Massachusetts. During the time the American army besieged Boston to rid it of the British, the American officers proposed the entire destruction of the city. "By the execution of such a plan, the whole fortune of Mr. Hancock would have been sacrificed. Yet he readily acceded to the measure, declaring his willingness to surrender his all, whenever the liberties of his country should require it." A man of his word, he demonstrated his integrity. One such example is John Peter Muhlenburg. In a sermon delivered to his Virginia congregation on January 21, 1776, he preached verse by verse from Ecclesiastes 3 - the passage which speaks of a season and a time to every purpose under heaven. Arriving at verse 8, which declares that there is a time of war and a time of peace, Muhlenburg noted that this surely was not the time of peace; this was the time of war. Concluding with a prayer, and while standing in full view of the congregation, he removed his clerical robes to reveal that beneath them he was wearing the uniform of an officer in the Continental army! He marched to the back of the church; ordered the drum to beat for recruits and nearly three hundred men joined him, becoming the Eighth Virginia Brigade. John Peter Muhlenburg finished the Revolution as a Major-General, having been at Valley Forge and having participated in the battles of Brandywine, Germantown, Monmouth, Stonypoint, and Yorktown. Another minister-leader in the Revolution was the Reverend James Caldwell. His actions during one battle inspired a painting showing him standing with a stack of hymn books in his arms while engaged in the midst of a fierce battle against the British outside a battered Presbyterian church. During the battle, the Americans had developed a serious problem: they had run out of wadding for their guns, which was just as serious as having no ammunition. Reverend Caldwell recognized the perfect solution; he ran inside the church and returned with a stack of Watts Hymnals - one of the strongest doctrinal hymnals of the Christian faith (Isaac Watts authored "O God Our Help In Ages Past," "Joy to the World," "Jesus Shall Reign," and several other classic hymns). Distributing the Watts Hymnals among the soldiers served two purposes: first, its pages would provide the needed wadding; second, the use of the hymnal carried a symbolic message. Reverend Caldwell took that hymn book - the source of great doctrine and spiritual truth - raised it up in the air and shouted to the Americans, "Give 'em Watts, boys!" The spiritual emphasis manifested so often by the Americans during the Revolution caused one Crown-appointed British governor to write to Great Britain complaining that: "If you ask an American who is his master, he'll tell you he has none. And he has no governor but Jesus Christ." Letters like this, and sermons like those preached by the Reverend Peter Powers titled "Jesus Christ the King," gave rise to a sentiment that has been described as a motto of the American Revolution. Most Americans are unaware that the Revolution might have had mottoes, but many wars do (e.g., in the Texas' war for independence, it was "Remember the Alamo"; in the Union side in the Civil War, it was "In God We Trust"; in World War I, it was "Remember the Lusitania"; in World War II, it was "Remember Pearl Harbor"; etc.). A motto of the American Revolution directed against the tyrant King George III and the theologically discredited doctrine of the Divine Right of Kings (which asserted that when the king spoke, it was the voice of God speaking directly to the people) was simple and direct: "No King but King Jesus!" Another motto (first suggested by Benjamin Franklin and often repeated during the Revolution) was similar in tone: "Rebellion to Tyrants is Obedience to God." Preserving American liberty depends first upon our understanding the foundations on which this great country was built and then preserving the principles on which it was founded. Let's not let the purpose for which we were established be forgotten. The Founding Fathers have passed us a torch; let's not let it go out.